"This recipe has wonderful flavor and the water chestnuts give it great texture. My husband loves meat but he'd prefer this over regular hamburgers anyway! 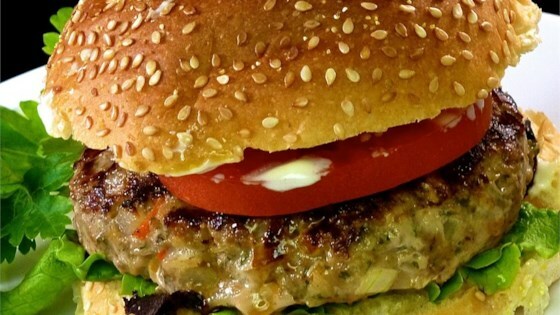 Make batches ahead of time and freeze the patties using waxed paper to separate." Mix ground turkey, onion, water chestnuts, bell pepper, garlic, parsley, soy sauce, water, ginger, salt, and pepper in a bowl; shape into 4 patties. Cook the turkey burgers on the preheated grill until no longer pink in the center and the juices run clear, about 4 minutes per side. An instant-read thermometer inserted into the center should read at least 165 degrees F (74 degrees C). 1/19/19: These are okay. They need a lot more Asian flavor. This was pretty darn good! I didn't have fresh ginger only powdered but it was amazing..will do again! I've never made turkey burgers before, and never really liked the ones I've had at restaurants, but these had a lot of flavor and did not fall apart. My husband loved them. Thanks for the recipe! Delicious and I will be making these again! I skipped the water chestnuts and added a pinch of Cajun seasoning for some flare. The burgers were a little too moist so next I won't add any water.